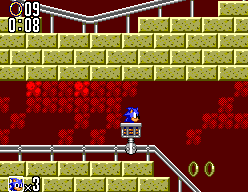 Under Ground Zone is the first Zone in the 8-bit version of Sonic the Hedgehog 2. This Zone is notable for being atypical of the series' usual tropical island trope, which is usually the setting of the first Zone. Under Ground Zone takes place in a mine, where you ride minecarts to dodge spikes and lava traps. The boss of this level is also infamous for its difficulty in the Game Gear port, as the limited playing field and varying speed of objects coming onscreen makes them difficult to dodge. You must use well-timed jumps to avoid both a meat-eating pincer and metal balls that Dr. Robotnik will toss at you. The Chaos Emerald located in this Zone is in Act 2. Towards the end, you will find a spring with a bug near it. Hop on the spring but do not turn right: go left, then roll down the ramp. If succesful, a mine cart will appear. Hop in to it and jump off at a staircase. Follow the stairs to the gem. Considerably less difficult on the Master System version, the Game Gear version is notorious for its steep difficulty. New Motora — Similar to Moto Bug. Beetle bots which simply roll back and forth in a small area. Meleon — Also known as Newtron. Chameleon bots which appear on walls, then transform into missiles and fire themselves on a horizontal path in Sonic's direction. Taraban — Similar to Crabmeat. Crab bots which quickly move back and forth over a small area. Every once in a bit they pause to fire flashing projectiles in either direction.